You would have heard about business and companies maintaining a balance sheet, which provides them a snapshot of their financial health. A practice that is good for businesses is also useful for personal finance. In fact, you just being aware of your assets, liabilities, net worth, income, expenses, and savings can help you in assessing an opportunity better; and you can make financially informed choices about investments, expenditures, and job changes. 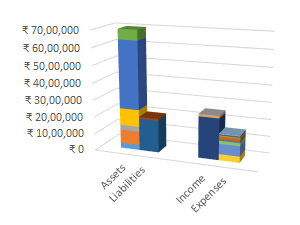 If ever you start a business, to the very least, it will help you in not being intimidated by business balance sheet as well. I will go as far as saying that personal balance sheet is the most basic tool, and without its assistance, it will be hard to assess how well or bad your finances are doing. 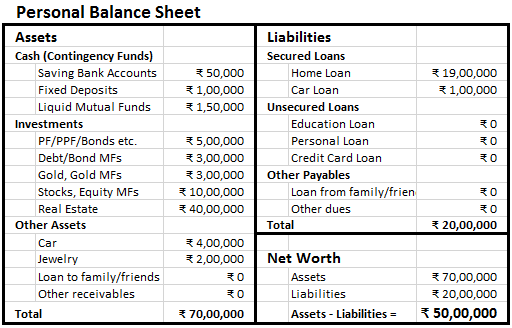 No matter how fancy the name personal balance sheet seems, it is actually very simple. And by the end of this article, you will master it. There are two parts of your overall finances: what you own (your assets) and what you owe (your liabilities). Net worth is nothing but the difference between these two. Simple! You have to just list all of your assets (e.g. cash, fixed deposit, provident fund, bonds, stocks, gold) and all your liabilities (e.g. various loans, credit card balances), and your balance sheet is ready! Here is a sample. Once you have made your balance sheet, you should figure out your yearly cash flow. It also has two parts: what you earn (income) and what you spend (expenses), and the difference between the two is called cash flow or savings. Again, simple! If your cash flow is positive, your net worth will increase over time, else it will decrease. Your budget should be positive cash flow machine. Generate saving surplus by improving income and controlling expenses. Invest that surplus wisely to create assets and increase your net worth. What do you think? Is it simple enough? Too cumbersome? Have any tips on managing it? Please share it in the comments. This helped me out! I've been wanting to make a personal balance statement for awhile now... Thanks! You are no Warren Buffett, so why pretend?